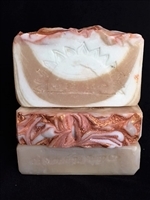 This shimmery copper and gold topped pumpkin cream soap has a very luxurious lather from the natural goodness of real pumpkin puree and coconut cream. 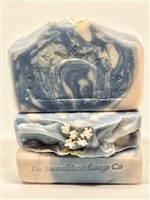 This soap has a rich, "ambery" type, warm, rich fragrance that reminds you of why the Magi brought these scents as gifts to the first Christmas. 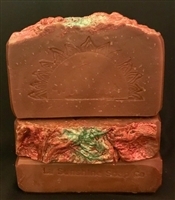 Scented with fragrances of tart cranberry, warm cinnamon, spicy clove, and juicy mandarin orange. 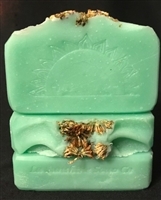 A crisp, fresh, clean "wintery" fresh scent of frosty air and wool sweaters....a hint of cool peppermint**.